Who doesn’t love an Heirloom tomato and Mozzarella salad sprinkled with fresh basil and then drizzled with a balsamic reduction? We know we love it! While you can make this recipe in so many different variations, with cherry tomatoes or otherwise, our favorite is with heirloom tomatoes when they are in season. 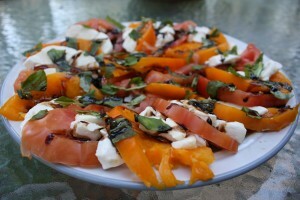 Tomato and Mozzarella salads are such a quick and easy side dish for a great barbecued meal and can be made in minutes. 2-3 Heirloom tomatoes, depending on size. If very large only need 2. Rinse off tomatoes and then pat dry. Slice Heirloom tomatoes into 1/4 inch thick rings. 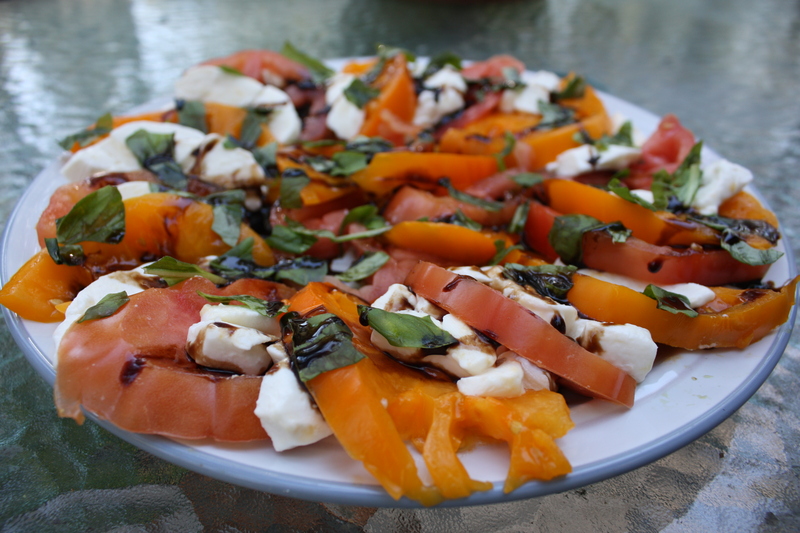 If using a larger Heirloom tomato, slice the rings in half on the larger sections. Sprinkle the tomatoes with a pinch of sea salt. Thinly slice fresh Mozzarella cheese. Rinse off your basil and then pat dry. Extra moisture is not good in this recipe at all because you want your balsamic reduction to stay thick and not get watered down when poured over the ingredients. Tear basil pieces into as small as possible of pieces. Set aside. NOTE: If you prefer not to do this by hand you can chop your basil–but it tends to leave bruising on the edges of basil and it does better when torn. On your serving platter alternate one tomato ring with a slice of mozzarella cheese. Continue this in a circle around the plate (see photo above). 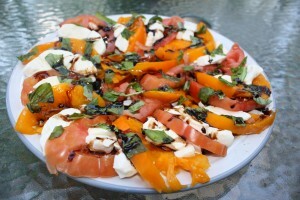 Sprinkle the heirloom tomatoes and mozzarella cheese with the fresh basil. Right before serving, drizzle the balsamic reduction over the salad. When we are trying to cut back on fat and calories we will not drizzle with olive oil as well–but it does add a nice flavor. If you don’t have a large fresh mozzarella ball and you have smaller balls of Mozzarella (such as Bocconcini’s) you can always chop the Bocconcini balls in half and then take cherry tomatoes (or larger tomatoes) and cut into similar size as the Bocconcini. Instead of presenting it on a platter you can then combine all the ingredients in a bowl, toss to coat with the balsamic reduction and then sprinkle Basil on each individual plate prior to serving.